i can't vote until my lunch break, but i can represent all day. naturally, joe is out working the streets. his most recent prediction* was the house by 15, and that we wouldn't take the senate. me, i'm managing my expectations: i'm just glad that i won't have to hear about jeanine pirro any more. side note to my peeps in california: re-elect arnie and you're dead to me. side note, via our freedom fighting friends at the bassett dispatch: need a button? *as of when i asked a few days ago, that is. correction: joe said that we'd take 25 in the house - half of the toss-up seats, plus the expected 10.
sara, in partial response to your offsite question: to be honest, i haven't been following cali politics too closely. 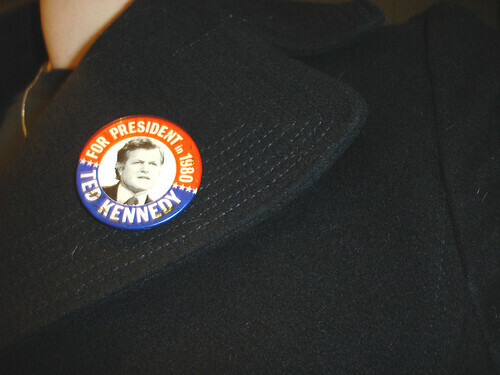 i simply fear its actor/governors (cf the ted in '80 button). to boot: the governator said "i really like sequels" in response to the re-elect... i think that was too much.